Reader Spotlight Kris F. from FL. Thanks to Kris F. for sending over this picture of her deals from Walmart. She shops at a store in FL. Her total before coupons was $24.50, after coupons it was $10 + tax. Although prices vary across the country from Walmart to Walmart, the prices are still fairly close. When I post prices from my store at $.97, from CA to NY they range from $.88 to $1.09. Usually, within $.10 of my prices. Here are the coupon matchups for the Dairy and Frozen foods on Coupons.com. There are a few other coupons available, my Walmart does not carry those products, I am thinking that most don’t. $.40/2 Pillsbury breadsticks or Italian pizza. Coupons.com has released a TON of new coupons. I ran over today to my store and spent a long time matching up prices to the new coupons. I am embarrassed to admit I lost my cart at one point. How weird is that? Check back later for over 100 different matchups! Thanks to MyLitter for this deal. 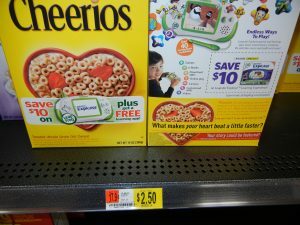 If you looking for a Leap Frog Explorer, you can save $10 when you buy a box of Cheerios at Walmart right now. Plus, there is a coupon for a FREE downloadable app on the box as well. There are also coupons right now for $5 off a Leap Frog Explorer game HERE. Total: $75.97 for all 3 items. ** Looks like the Capri Suns are already gone! Here are a few really good coupons to print. $1 off both Capri Sun and Kraft Dressing. I am heading over in the morning to price check these, but if you want them you might want to print now. It isn’t often that you see a Capri Sun coupon! Thanks Coupon Katarina. Wow, thank so much to reader Carmen G. for passing this great deal along! Carmen found a $1 blinkie at her Publix (my wife is so jealous of anyone with a Publix) and her Walmart has the Gatorade Recover on Roll Back for $1 making them free!